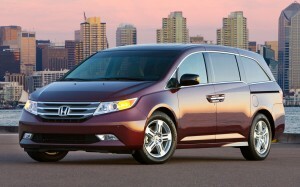 The 2013 Honda Odyssey is an excellent minivan available at our Orange County Honda dealership, Middletown Honda. This great family vehicle has a long history of excellence and flies off of our lot faster than we can stock them. That said, there are plenty of competitors to choose from on the market; Toyota offers a similar type of vehicle in the 2013 Toyota Sienna. Let’s see how they stack up! The engines of both of these models are very similar in size, but the 2013 Odyssey LX with an automatic transmission has the edge in most of the important categories. The Odyssey features higher maximum torque with a rating of 250 lb-ft versus the 245 lb-ft of the Sienna. Even the smallest differences can make a huge difference in power. The Odyssey also features a more efficient engine, getting drivers an EPA-estimated 27 mpg on the highway (EX-L models and below) compared to the Sienna’s 25 mpg. * Honda also has a larger gas tank at 21 gallons, meaning you’ll be filling up less often too. The Odyssey also features 172.5 cubic inches of passenger room versus the 164.4 cubic inches of the Sienna, meaning that the Odyssey is more efficient with its interior room versus the Sienna. Ironically, this means you’ll have more room in Honda’s new minivan than you will in the larger, bulkier Sienna. So far, the Odyssey has a reasonable edge over the Sienna. However, it simply vaults ahead of the Toyota when it comes to extra features. The most basic trim model of the Odyssey comes with privacy glass, fog light accessories, cargo area tie downs, stereo anti-theft, power driver seats, floor mats, rear view camera, a rear electronic parking aid, and much more. Some of these are optional on the Sienna while others are not at all available; they are all standard on the Odyssey. Why Not Test Drive the Odyssey? Although the Sienna is a fine car, the 2013 Odyssey is simply the minivan to beat for Orange County car buyers. Come on down to Middletown Honda and take a test drive today. We’re located at 520 Rt 211 East in Middletown. Stop on by Monday through Thursday between 9:00 am to 8:00 pm, Fridays and Saturdays between 9:00 am to 6:00 pm, or Sundays 10:00 am to 4:00 pm. Call us at 1-845-343-0055 if you can’t make it down in person.